Lasiodora parahybana (Lp) Fan Club! 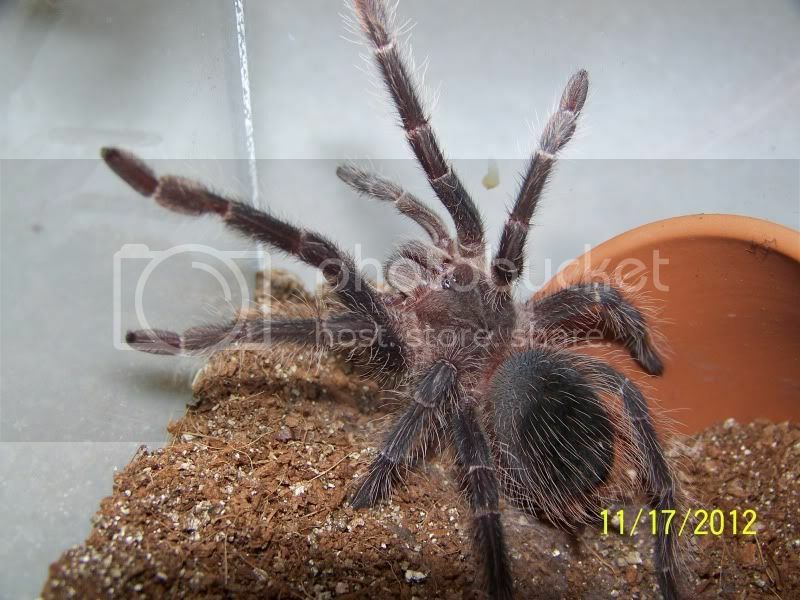 Thread: Lasiodora parahybana (Lp) Fan Club! So, noticing that Marc started a New River fan club, it hit me today that I would really enjoy an Lp fan club. Let's post our pics and likes of these awesome T's here! Gotta love their growth rates! Here is Leviathan molting to MM from 5.25" to 7.5"
I SO love their adult coloration (are males much different than females? I don't have an adult female yet. Toss the male in, take him out of the water dish in bolus form the next day. 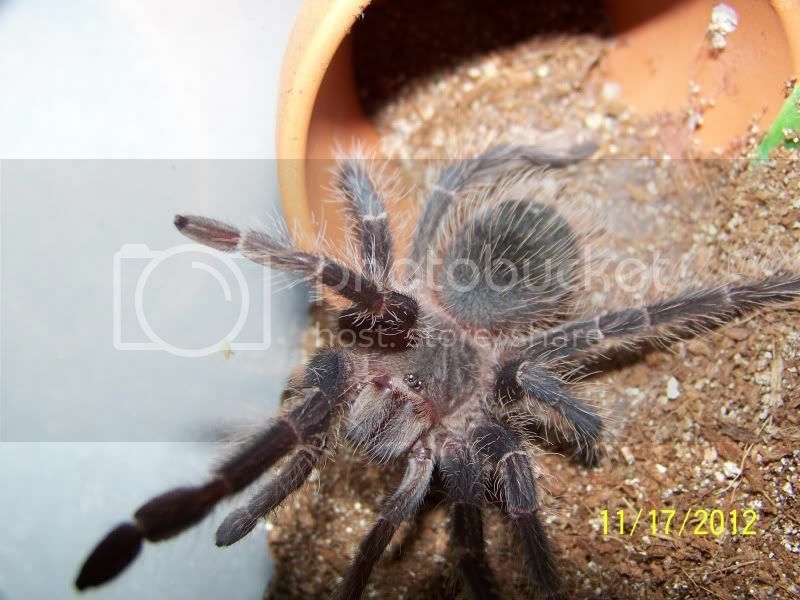 DISCLAIMER - Handling tarantulas with potent venom is not advised or endorsed by this forum. In certain cases of envenomation, hospitalization has been required. Please use caution when dealing with these species. OK that took longer than expected. Had to clean out the SD card....gak! Here's Blitz my beautiful LP! LOL, Scott, I think we think alike... after 'playing' with Sabre, I was debating an 'LP fan club' too! Life itself is our most precious gift! 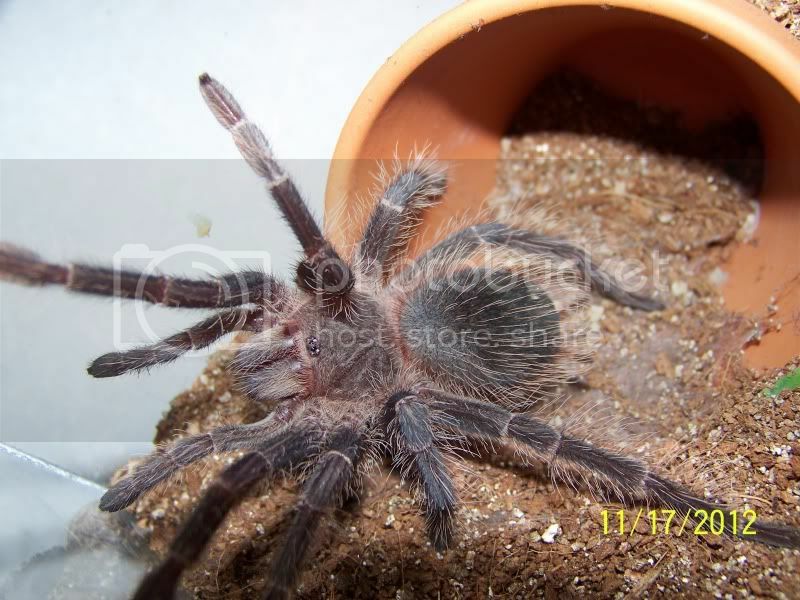 Disclaimer: This forum does not endorse handling any tarantula. ALL T's are venomous, and could bite. Handle any T at your own risk. Scott are you trying to push LP's again!!! Argh you t pushers make my life difficult. Lol! Please Read The Forum Rules Below! This is Belle...large juvie LP. Acanthogonatus pi ss ii 0.2.0, Acanthogonatus francki 0.2.0, 1-Linothele fallax 0.1.0, A. vilches 0.1.0, Diplura sp. Sanguinea 1/2"
So how big are your girls folks? I wanna know. What is the biggest LP you have seen or owned? For me, the MM I traded off this summer (Leviathan) grew to 7.5", but I know that is small, even for males who can reach 8.5". Of course, that is all leg. I have 3 slings now (almost 2 inches) and one just hit premolt today. I know one is female, the others are most likely male, but we shall see. And what are your Lps like in temperment? I noticed that Leviathan was nervous, but not aggressive. Any time he threw a threat pose, he would back down almost immediately, making me believe he was bluffing. In hand, he was nervous, but fine, especially after hooking out. Leggy and unstable, but not aggressive or bitey. Gotta love the appetite of these guys! I once gave Leviathan 13 crickets in a day! But his appetite slowed considerably after he hooked out, until one day, I threw in a cricket and it landed right on his face. This is one of my very favorite pics! I love that pic, Scott! Well, I have 2 LP's. 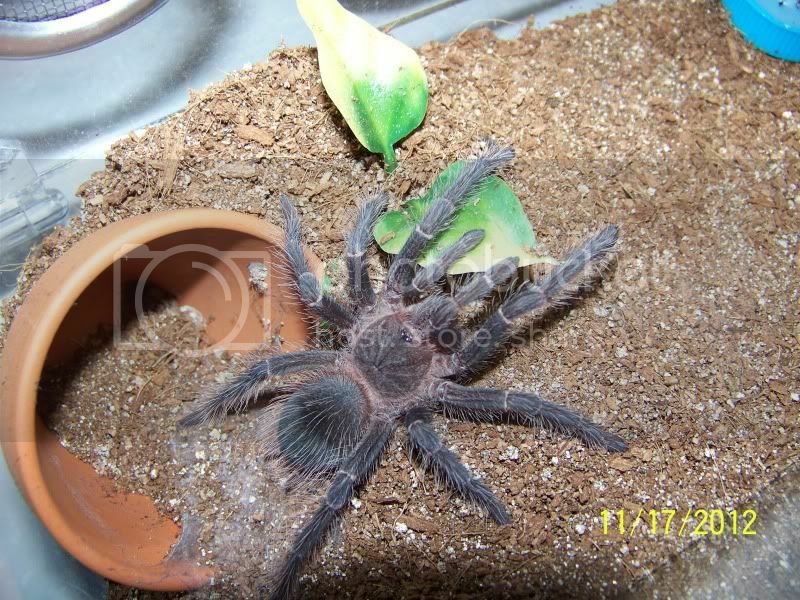 Brawny is an unsexed 3", he used to be VERY gentle, once he had his last molt, he is pretty aggressive, sadly. A couple weeks ago, I was watering him, and he lunged at my thumb, I literally pulled my thumb out of his fangs..
Sabre is better, temperment-wise. Sabre was a freebie from Tappy here, and is about 6" in normal sitting position.